So, all joking aside, I am in the process of going paperless. This is a big challenge for anyone in academia, a culture known for endless piles of books and papers (with a professor buried somewhere in the rubble). However, because I teach in a blended program (primarily online with brief on-campus residencies), I think my situation is more accommodating to a paper-free workflow. The majority of my work is already conducted online. Syllabi and supplemental materials (handouts, PowerPoint) are posted in digital files to the course web site. Students submit most assignments to that site and I grade them on my computer, no printing needed. Communication with students and colleagues is conducted via email, phone, or WebEx. Most of my books and resources are stored digitally as well. Thanks to my Kindle, I carry hundreds of books on one device instead of lugging arms full of books on a plane or to the classroom. In fact, I’ve already reduced my physical library to less than one bookcase. (That confession alone might disqualify me as a bona-fide academic!) I conduct research online via digital databases and libraries. And I can’t tell you the last time I consulted a physical dictionary or thesaurus, as Merriam-Webster has an online treasure trove of resources. Meanwhile, I have also transitioned quite successfully to Evernote as a repository for lists, ideas, clipped web pages, etc. All of my more traditional documents (Word, Excel) are stored in Dropbox in a well-organized collection of digital file folders. I have similar file systems for my email accounts. Having already traveled this far down the paperless path, I decided this would be the year that I make the full transition. 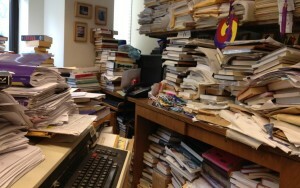 Over the weekend, I spent several hours going through my file cabinet. I ended up discarding three full paper grocery bags full of documents. Some of it was stuff I had saved for years but realized I no longer need. A lot was paperwork I also have in digital form on my computer, so the hard copies were redundant. After the purge I was left with one very small pile of papers worth keeping. My next step will be to purchase a Fujitsu ScanSnap scanner so that I can file these digitally as well. (I’m thinking I might pay my 12-year-old to help me with this task.) And I will continue to manage new materials as they come in: filing emails, saving attachments, or scanning and filing digital versions of paper documents. Any remaining essential paper can be stored easily in the small file drawer in my desk. Anyone want to buy a really nice steel file cabinet? For illustration only; this is not my own office!